Cornish Pirates director of rugby Ian Davies was not happy with how his side played in their 20-18 Championship defeat by Moseley on Saturday. 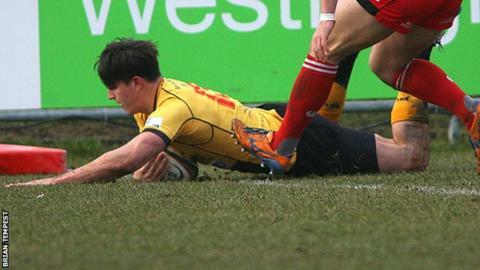 The Pirates trailed 15-11 at half-time and Alex Cheesman's try was the only Pirates score after the break. "This week we just didn't turn up," Davies told BBC Radio Cornwall. "Moseley didn't do a lot really, but we couldn't keep the intensity for long periods and there were some silly errors from us." The results sees the Pirates, who beat leaders Bristol last weekend, slip a place to seventh in the Championship. It also extended their winless run at Moseley to five games, having last won at the Birmingham-based side in February 2009. "We were passive in defence, whereas last week we were very aggressive in defence, so it gave Moseley a bit of heart," continued Davies. "In the last 15 minutes it looked like only one side were going to win it and the other side were hanging on. "But 15 minutes isn't good enough if you want to win in the Championship, you have to play for the full 80."